The government, during the last four years, has been working on building an end-to-end, holistic scientific ecosystem. This includes enhancing the quality and quantity of impactful basic research to translation research to technology development, to technology transfer, to innovation and startups to enabling commercialization of indigenous technology. 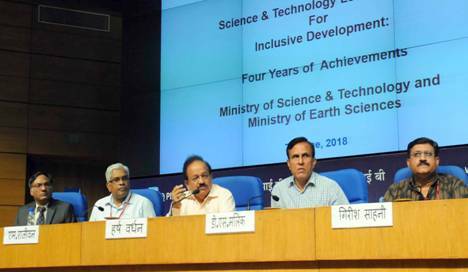 Union Minister for Science & Technology, Earth Sciences today briefed media about achievements of Ministry of Science & Technology and Ministry of Earth Sciences in last 4 years in New Delhi. The minister said, our science is now working to solve important challenges in the areas of water, energy, health, environment, climate, agriculture, food. At the same time, India is getting future-ready in launching ambitious missions in cyber physical system, Artificial Intelligence, Super Computing, Deep Ocean, biopharmaceuticals, and others, which will make us globally competitive in a rapidly changing world order, said Dr harsh Vardhan. The government has also connected our science to our national needs, opportunities and priorities, such as those reflected in the national missions like Make in India, Start-up India, Digital India, Swachh Bharat and Swasth Bharat. Government emphasizes on new and strong connections with industry, education, with the line ministries and with other nations. S&T collaborations with the best in the world benefit immensely our scientific community and R&D institutions. Some noteworthy international collaboration during the last four years are: India becoming a partner in the LIGO project for gravitational wave detection with agreement to set-up the detector station in India and India becoming an Associate Member State of CERN; Establishment of India-Israel Industrial R&D and Technological Innovation Fund, etc. The investment in Science, Technology and related areas has gone up during the last four years starting 2014-15 to 2018-19, as against five years earlier, i.e., 2009-10 to 2013-14. The budget allocation to Department of Science & Technology was Rs. 19,764 crores, which is a whopping 90% increase. Similarly, there was an increase of 65% for the Department of Biotechnology; almost 43% increase for CSIR and 26% increase for Ministry of Earth Sciences. The notable achievements during the last four years have been development of new technologies and transfer of over 800 technologies to the industry. A new synergy has been established between intra-ministry laboratories and inter-ministry institutions. Scientific laboratories have increasingly become problem-resolution hubs for many government agencies like Railways, Heavy Industry, Urban Development, Defence, Drinking Water and Sanitation, Power, Coal and New and Renewable Energy. Ministry of Petroleum and Natural Gas to name a few. The approach has been realigned to have a mix of fundamental science and application science. This year's budget announcement on Mission for Cyber-Physical Systems is one such example of application science. Mission-based projects on Supercomputing, Aroma, Sickle Cell Anemia and Biopharma are some illustrative examples of application and solution science initiatives. S&T intervention in Agriculture sector to improve crop productivity makes a huge impact on rural economy. Ministry of Earth Sciences provides agro-meteorological advisories to 24 million farmers currently, which will be scaled up to 40 million by July 2018. The timely weather information has helped in farming activities, which had resulted in a positive economic impact of Rs. 50,000 crores to national GDP. During the last four years, the quality of weather and ocean forecast services has improved substantially. On 1 st June, 2018 Ministry of Earth Sciences has commissioned the Ensemble Weather Prediction system, one of the best in the world, for generating probabilistic block level weather forecasts. This was possible due to the procurement of new Super computers Pratyush and Mihir with a combined capacity of 6.8 Peta Flops by the Ministry. A similar kind of information is provided to fishermen in the country on potential fishing zones, on fish availability. These advisories reach more than four lakh users every day, a four-fold increase during the last four years. A joint research by CSIR DBT and ICAR has developed blight resistant improved Samba Mahsuri Rice, which is now being cultivated in an area of 120,000 hectares in seven states. This variety of rice is amongst the low glycemic index, which is amongst the lowest value for several rice varieties tested and thus, is considered highly suitable for diabetic patients. CSIR has launched a project in Mission-mode for development of Chemical Intermediaries and Active Pharmaceutical Ingredient (API), which would significantly reduce India's dependence on imports, especially from China. With India pledging to reduce fossil fuel, the new energy mix includes higher percentage of clean energy. Several technologies have been developed indigenously by CSIR, such as coal dust collecting and briquetting system, Solar Power Tree, Novel Hydro-Electric Cell, etc. India's first Second-Generation (2G) Ethanol plant has been formally unveiled and transferred to Bharat Petroleum Corporation Ltd (BPCL) and Hindustan Petroleum Corporation Ltd (HPCL) to build commercial scale biomass ethanol plants. In the area of Clean Energy India today occupies a leadership role in the 23 country Mission Innovation network. In less than 3 years, the investment in R&D has been doubled. India has announced the first International Clean Energy Incubator. As several areas in the country are facing acute shortage of water or poor quality of drinking water, the Ministry has launched several initiatives during the last four years to augment safe drinking water at affordable cost through appropriate S&T interventions developed indigenously. In order to boost the start-up ecosystem, government have increased the allocation by five times in DST alone. The Ministry has supported more than 5,000 Start-ups and 200 incubators. Apart from this, the ministry has also launched a programme called MANAK (Million Minds Augmenting National Aspiration and Knowledge), to trigger innovation among school children from 6 th to 10 th standard. S&T manpower is the foundation of R&D. During the last four years, ministry has enhanced capacity building of scientists, teachers, young researchers and attracting students to science streams. Ministry supported around 11 lakh persons – right from school level to post-doctoral research. The Department of Science & Technology has launched several new schemes to attract young scientists. The Ministry has successfully attracted more than 600 eminent scientists of Indian origin from overseas to return to the country.